Google Now has been included in Android since version 4.1, and Android has continually added enhancements and new features to it. Google doesn’t always do a good job of publicizing these new features, however. Actually, Google rarely does a good job of explaining the enhancements, so you may not be aware of some of these capabilities. Most users, we think, are familiar with Google Now’s “Cards,” which provide information related to your location, the weather, previous Google searches and web sites you’ve visited . 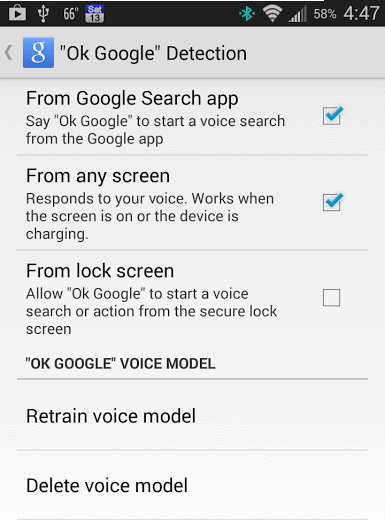 And you probably know that you can do voice searches with Google Now (“OK Google. Who starred in the movie Star Wars?”) Not as many are aware of all the other things you can control with your voice. Note: much of what is discussed in this article is dependent on your location. Some of the commands discussed may only work in the United States, others may only work in English speaking countries. If you speak English, you can enable the missing features by setting your langage preference to U.S. English. Before talking about the voice commands themselves, one recent update to Google Now has added a very simple feature that makes voice much more convenient to use. Previously, you needed to navigate to the Google Now search page to use voice commands. You now have the option to enable voice recognition on any page, when the screen is on. And even with the screen off, as long as the phone is plugged in and charging. You can even start a voice search when your phone is locked, although we don’t suggest that. As Google points out when you select this option, anyone who gets access to your phone could bypass lock screen security and gain access to some of your personal information. To enable this feature, navigate to Google Now. Tap the menu button (or the menu icon on some newer devices) and then Settings. Tap Voice, then “OK Google” Detection. Select one or more of the options available, and then choose “Train voice model.” This allows Google Now to better recognize your voice, and ignore other people who might be speaking near you. Now let’s look at voice searches a little bit more closely. You can, of course, speak any search you can type into a regular Google search in a web browser. “T-Mobile.” “How old is Brittany Spears?” When was the US Constitution ratified?” “Find pictures of Ariana Grande.” But since your phone knows your location, you can also narrow searches based on where you are. Say “OK Google,” then “Find Pizza near me.” The ability to automatically include location information in your searches is a great feature of Google Now. There are probably even more voice commands available. Have you found any that aren’t listed above? If so, let us know. If you haven’t used these, give them a try. Pronunciation can be critical in order for Google Now to provide the right results, so be sure to speak slowly and clearly. And as good as Google Now voice commands are, you can actually add even more commands with a helpful app called Commandr for Google Now. See our article about this app, here, for more information.